Preheat oven to 375 degrees F (190 degrees C). Cut pumpkin in half (horizontally), and place cut-side down on large baking pan. Bake for 1 hour, or until very tender. Remove from oven, and set aside to cool. Reduce oven temperature to 350 degrees F (175 degrees C). Scrape pumpkin into a food processor; puree until smooth. Transfer to a kitchen towel or cheesecloth, and squeeze out excess moisture. Measure 1 1/2 cups pumpkin puree, and place into a large bowl. Mix together with the brown sugar, cinnamon, ginger, nutmeg, cloves, allspice, and salt. Stir in maple syrup, half-and-half, and flour. Then nix in eggs, one at a time, and pour the filling into the unbaked pie shell. 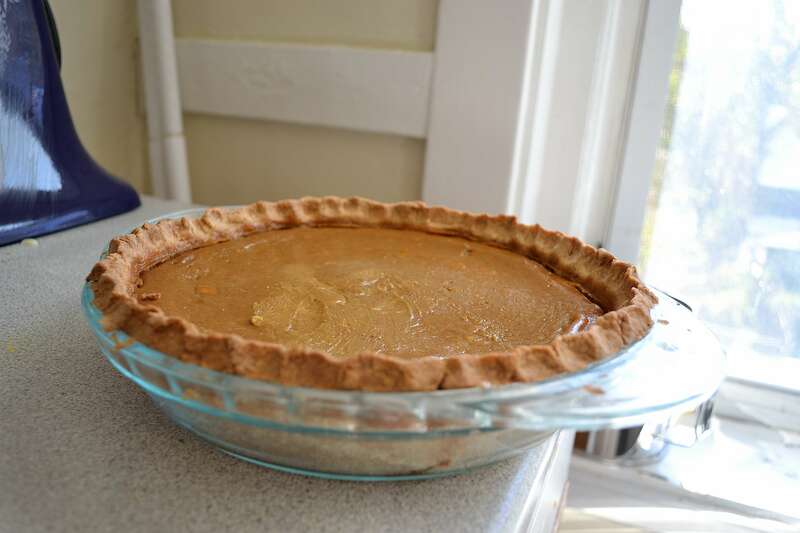 Bake at 350 degrees F (175 degrees C) for 1 hour, or until center is set; test by inserting a knife near the center of the pie. Allow to cool for an hour; serve or store in the refrigerator overnight. To read more about this pie and my musical pairing, click HERE.